The Internet entered China in 1994 and in recent years the number of users has increased rapidly. Currently the number of Internet surfers in China is second only to the United States.The Ministry of Information Industry vows to extend phone services to every village and enable every township to gain access to the Internet by 2010. Mài kè: Zhè gè zhōu mò nǐ dǎ suàn zuò shén me? Lì li: Wǒ dǎ suàn shàng wǎng chá yuè yī xiē guān yú hǎi nán de zī liào. Lili: I am going to surf the Internet for some information about Hainan Island. Mài kè: Nǐ zhǔn bèi qù nàr lǚ yóu ma? Mike: Are you going there for a tour? Lì li: Shì de. Nǐ zhōu mò yǒu shén me ān pái? Lili: What's your plan for the weekend? Mài kè: Wǒ yě yào shàng wǎng, chá yuè yī xiē yǒu guān hàn yǔ xué xí de xìn xī. Mike: I'm going to surf the net too, to get some information about Chinese learning. Lì li: Wǒ gěi nǐ fā yī xiē wǎng zhǐ, kě néng duì nǐ huì yǒu bāng zhù. Lili: I can send you some websites that may be helpful to you. Mài kè: Xiè xie. Wǒ xū yào yī suǒ xū nǐ dà xué de wǎng zhǐ. Mike: Thanks. I need a virtual university website. Lì li: Wǒ men kě yǐ zài wǎng shàng sōu suǒ yī xià, kěn dìng huì zhǎo dào de. Lili: We can search on the net and I am sure we can find some. Mai kè: Duì, nǐ yě kě yǐ zhǎo dào hé shì de xū nǐ jià rì shèng dì. Mike: Yes, and you can find some suitable virtual holiday destinations, too. Lì li: Xiàn zài hù lián wǎng shǐ rén men de shēng huó fāng biàn duō le. Lili: Nowadays the Internet has made people’s lives more convenient. Mài kè: Shì a, lián wǒ de fù mǔ dōu zài wǎng shàng gòu wù, liáo tiānr, wánr yóu xì. Mike: Yes, even my parents do online shopping and chatting and play online games. Lì li: Lián wǒ de xiǎo wài sheng yě huì zì jǐ xià zǎi dòng huà piānr le. Lili: Even my little nephew can download cartoon movies by himself. Literally, "Only one side is willing," which means "wishful thinking." Learn Chinese quickly and easily! Here are a lot of online lessons with video, including reading, writing, vocabulary, grammar, examples and exercises. Shuǐ miàn chū píng yún jiăo dī. Shuí jiā xīn yàn zhuó chūn ní. Qiăn căo cái néng mò mă tí. 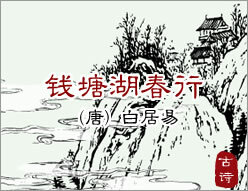 Lǜ yáng yīn lǐ bái shā dī.